Saturday Night Live's Weekend Update hosts just might have done their funniest bit yet. 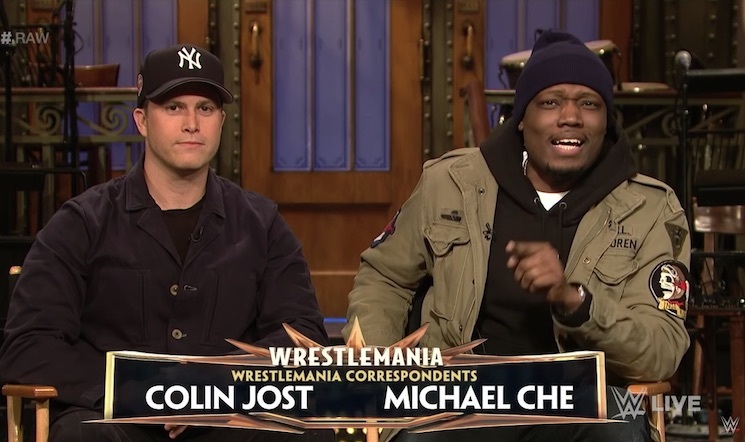 Colin Jost and Michael Che made an appearance on the WWE earlier this month, but now they have officially announced plans to step into the ring. The duo will square off against the 385-pound beast of a man named Strowman as part of WrestleMania 35, which takes place on April 7. Strowman spoke to the Weekend Update hosts over satellite, where they sat on the iconic Saturday Night Live stage. Through five minutes of banter, including some one-liners that some might consider "jokes," they eventually concluded that they had to fight. Check out the video below, and watch Che and Jost surely get their asses handed to them when WrestleMania goes down.